Kaylie and I were taking out the decorations from the garage to decorate the house. She found the garland, which she immediately wrapped around her neck She had a lot of fun pretending that the garland was a feather boa. I think she looks fabulous! 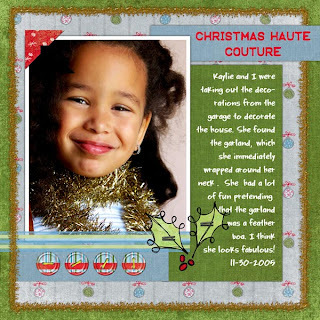 11-30-2005*Kit: Share In The Season, by Sara Carling, Scrapbook-Graphics.Share in the Season isn't just a kit. It's an opportunity to adopt a deserving family this holiday season. Steph & Scott's son Asher was diagnosed with with a brain tumor in May of this year. Since then their lives have been turned upside down as they help their son fight the cancer. Asher has been amazingly strong & resilient through all of this, and their story is one that can inspire us all. Asher also has two adorable younger sisters; Alexa who is 2; and Aubree who is 6 months old. All proceeds from this kit will go directly to Asher & his family to help them have a brighter holiday season. You can read more about Asher's story here.http://www.asherbenjamin.net/* Brush and Style – Garland -Photoshop, by Terry Maruca, Scrapbook-Byteshttp://scrapbookbytes.com/store/product.php?productid=20106&cat=0&page=2Note: The garland looks dull on this preview, but it is sparkly and shiny on the original version. *Designer Photoshop Action – Button Maker – Roberta D’Achilles, Rendered Memorieshttp://renderedmemories.com/shop/index.php?main_page=product_info&products_id=126Font: TXT Menu Item and Embossing Tape (Title)Sketch by Becky Fleck.